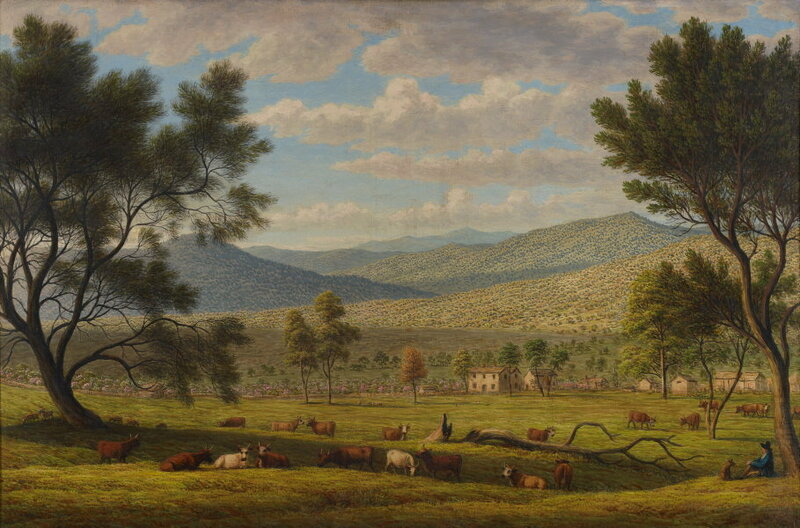 Painted towards the end of John Glover’s career, 'Patterdale Farm' depicts the artist’s Australian property at Mills Plains in northern Tasmania, named after the town at the foot of the Ullswater in England’s picturesque Lake District, close to where his home Blowick Farm stood. 'Patterdale Farm' reveals the painter’s distinctive technique, whereby colour is applied in transparent veils, with diluted layers of oil delicately brushed in over a cream white ground. 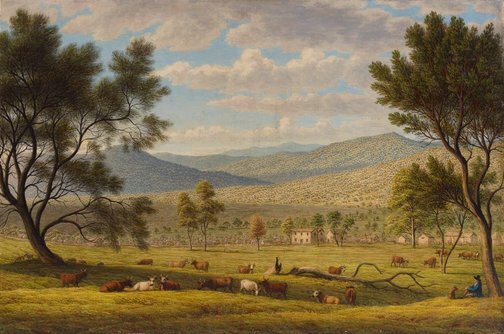 Glover’s sensibility and refined evocation of the light and landscape of Tasmania made him one of the most admired painters in colonial Australia. Terry Ingram, The Australian financial review , 'Another Glover for NSW: an "exercise in painting"', Sydney, 22 Aug 1974, page number unknown. Elwyn Lynn, The Australian , 'An eye for Glover''s nature', Sydney, 20 Oct 1986, 6. Look , 'The art that made me: Reg Mombassa', Sydney, Nov 2015, 13 (colour illus.). Not as the songs of other lands: 19th century Australian and American landscape painting , 2017, 2-3 (colour illus. ); 75 (colour illus. ).